Black Panther #10 dropped last week. We’re well beyond the point of hypothetical civil war in Wakanda or trying to stop it. When I first discussed this I emphasized the individual becoming self-realized well into an event in progress. Then, there were three factions vying for power: the Golden City, the Dora Milaje, and Tetu’s company. Now, there are two. The Midnight Angels, leaders of the Dora Milaje, have just been confronted by Queen Shuri, on behalf of the Golden City, who has told them they can continue to stand in independence and choose how they lose the fight for their country against Tetu, or accept that, while different, they have enough in common with the incumbent crown to defend “this new nation” that has come to be through the struggle. “This new nation” is a fascinating marker of progress for a world that’s otherwise on fire. Characters who were seeking themselves have found what they were looking for. 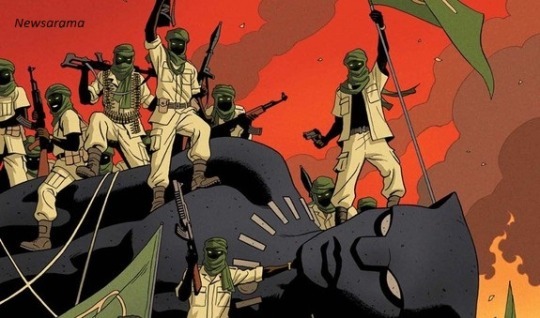 The Midnight Angels and Dora Milaje, for instance, have “built a nation of our own [in the Jabari Lands]. The theories of Changamire are actually our works.” They sought a new home because they felt the one they loved was hopeless. They became self-sustaining in its perceived wake. Meanwhile, the Wakanda they left behind has persisted even if on life support. It’s sought to stand with resolve again. In a discussion of high ranking officials, the Golden City is emphasized as not only their capital but “a symbol of our mettle.” They refuse to cease their attempt to stand again, to give someone else jurisdiction over what and who they have stood for. This dilemma – being among people we see as different – regards the community’s impact on an individual and vice versa. We answer how important it is to draw a line in the sand before we’re asked. We become different and suddenly we view coming together as a death levied by compromise. It’s no wonder we stand so often in paralysis of the present. But coming together right now in Wakanda isn’t about compromise. That would imply at least one side is reshaping its principles to fit better with the other. Neither the Dora Milaje or Golden City is doing that. It’s not about fit for them. The Truth is it’s about motion, about being able to continue to move. Black Panther is showing Truth better than any book out right now. Speaking about BP, writer Ta-Nehisi Coates has stated multiple times how history is a fact and is something people have to deal with. As this first arc drives toward a collision, history is happening, and Wakandans are showing us the dubious connection we all share.